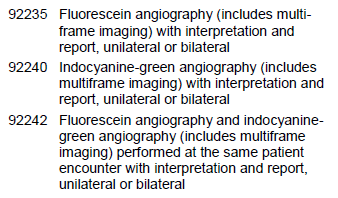 Q: : What are fluorescein and indocyanine-green angiography (FA and ICG)? A: FA is a test that allows imaging of the vascular system in the retina and choroid. It is performed by injecting fluorescein into a vein, and taking a series of photographs of the retina and choroid as the dye flows through the blood vessels in the eye. Q: What are the indications for these tests? A: FA allows the clinician to evaluate a wide variety of retinal diseases, such as proliferative diabetic retinopathy, macular edema, vascular occlusive disease, age related macular degenera-tion, and ocular tumors, as well as other retinal pathology. Many third party payers publish policies identifying covered indications for testing. Q: Does Medicare cover FA and ICG? A: Yes, for covered indications and as part of the overall evaluation and management of disease. For example, FA following treatment of choroidal neovascularization (CNV) is necessary to monitor for recurrence or to detect additional treatable lesions. Medical necessity for testing usually occurs in the presence of a change in the clinical assessment. Check your local coverage determination (LCD) policy for guidance. Q: What documentation is required in the medical record to support these claims? Q: Is the physician’s presence required during testing? Q: What CPT codes should we use to describe these tests? Q: What does Medicare allow for these tests? Effective 2017, the codes are defined as “unilateral or bilateral” so are paid once whether one or both eyes are tested. Q: Are there restrictions on other codes that may be billed the same day? A: According to Medicare’s National Correct Coding Initiative (NCCI) edits, separate reimbursement is allowed for FA and/or ICG when performed in conjunction with an exam (except 99211). Most other diagnostic tests are also permitted, although fluorescein angioscopy (92230) is bundled with 92235, and fundus photography (92250) is mutually exclusive with 92240 and 92242. 1 42 CFR 410.26(b)(5). Billing physician as the supervising physician. Accessed 03/15/16. 2 80 FR 70885 CMS-1631-FC. 2016 Medicare Program; revisions to payment policies under the physician fee schedule. Published Nov 16, 2015. Accessed 03/15/16.